Roll up Roll up! 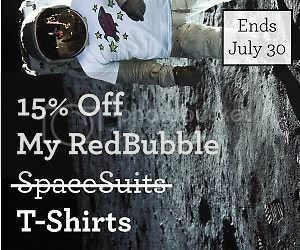 – Get your cheap and (guaranteed to make you) cheerful T-Shirts from Redbubble for the next week at 15% off current prices. This also means that if you’re lovin’ it large and buy 5, then you’ll also get them shipped for free. Sweet! Did I mention I have T-Shirts at Redbubble?